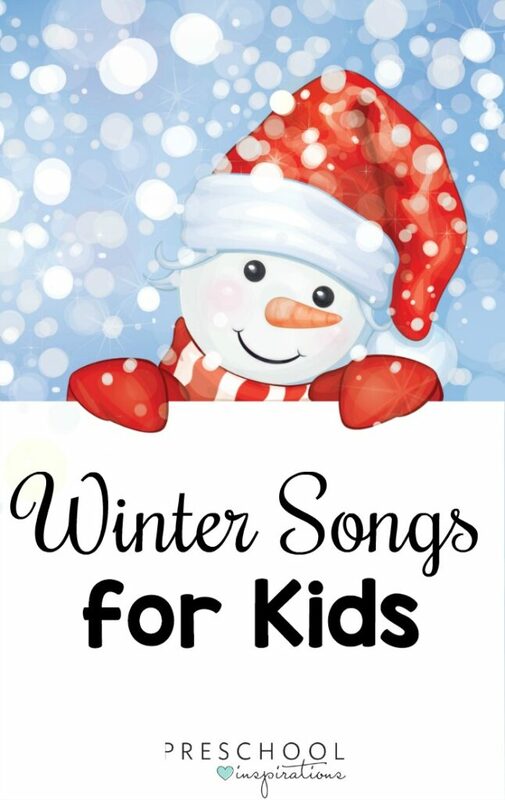 Winter songs for kids are a great way to warm up those muscles on those cold days. 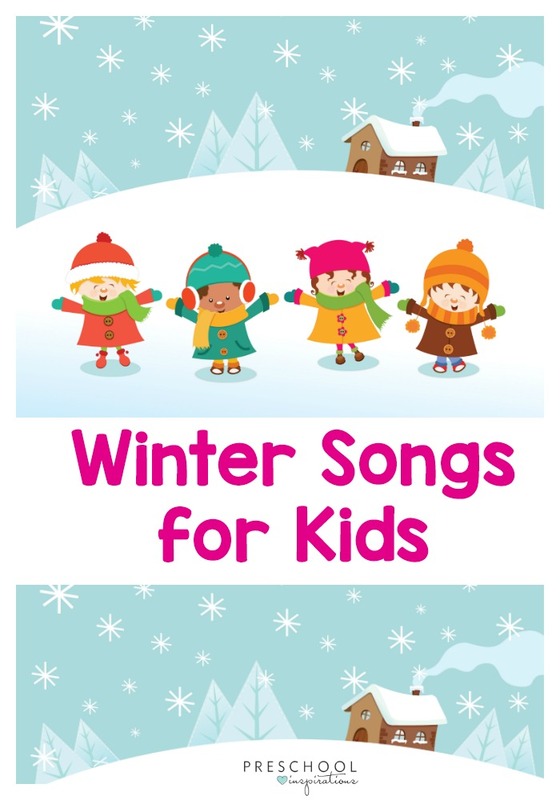 These songs will go perfectly with a winter, snow, or arctic preschool theme. We especially love winter songs because they are a great way to get moving and use those gross motor muscles when it might be hard to get enough outside time. Here’s a roundup of the best winter songs for preschoolers! They’re great for singing about snow, snowflakes, snowmen, and all things snow! Let’s get this list started off with a bang…you guessed it, there’s a winter baby shark! A very cute winter version of the hokey pokey! This is a great dance song for preschoolers that works on following directions. When you sing and dance to the song, make sure to mirror the motions if you are facing the children so that they know which side of the body is right and left for them! Everyone’s favorite Koo Koo Kanga Roo guys are back – and frozen! There’s some fun dance moves, as well as a silly spelling word that anyone can master. A very sweet winter song for preschoolers! It’s set to the tune of “I’m a little teapot,” so your kids should be able to pick it up quickly. This one’s a little calmer than the first three, so would make a great transition song to a quieter activity. I just love the animations that go along with this winter song for kids. They’re more detailed than a lot of kids’ songs, and the whole time they show a family outside having fun together, which just warms my heart! The song itself is simple and repetitive, which makes it great for your class or kids at home. We included this song in our Christmas Songs for Kids post, but it’s so good that it is worth repeating! This sweet little rhyming song is done first as a chant, then the same words repeated with a melody. Chanting and singing are actually different skills and both are very beneficial! I have to admit that I watch this video all the way through every time I come across it, even when I’m by myself! It’s another one that’s good for a transition to a rest time or a calm activity, as it’s quieter and doesn’t encourage movement. A lot of Just Dance choreography seems to be too hard for my kids to actually master, and they lose interest because they can’t follow along. Not so with this freeze dance! Even the littlest children will have a great time following along to the catchy winter song. Here’s a sweet snowflake song to add to the “calming music” list. The words are printed on the screen which encourages word recognition, and some early readers will even be able to follow along! The song is set to the familiar “ABC” melody, so your kids will be singing along in no time. The next three videos are all variations on what might be my new favorite winter song! It’s got tons of great skills – following instructions, word recognition, and patting/tapping on the beat. This winter song can also be used as a fun brain break! This version is essentially the same, but features some fun footage of real penguins and real people doing the dancing. This one is the same idea, but entirely animated. It’s up to you which will resonate the most with your kids! Let’s end the list with a classic! I’ve always thought of good ol’ Frosty as a Christmas song, but upon repetition, I realize that he’s good all winter long. Thumpety thump thump! Need some more great preschool songs for your home or classroom? We’ve got you covered!